eaw029084 ENGLAND (1950). 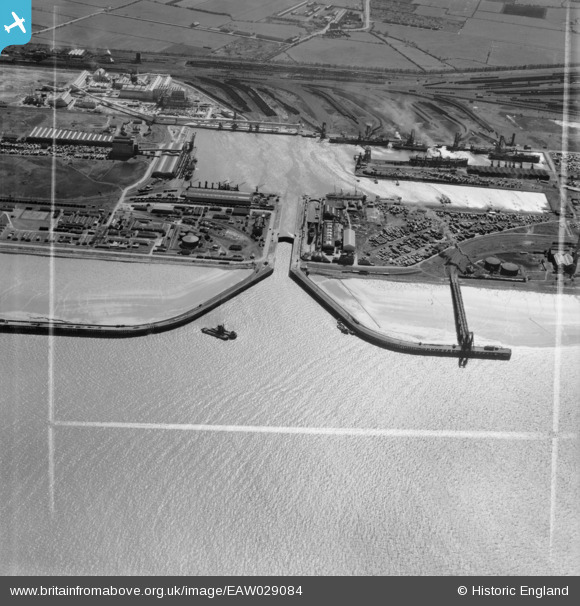 Immingham Dock, Immingham, 1950. image was marked by Aerofilms Ltd for photo editing. Title [EAW029084] Immingham Dock, Immingham, 1950. image was marked by Aerofilms Ltd for photo editing. Location of a gun pit for a 2ndWW HAA Gun Battery at Immingham (GDA Humber), designation number -/H22. Two of the admin/accommodation huts survive nearby. Location of 2ndWW US Army Camp. "Cenotaph" coaling tower for filling locomotive tenders with coal. It was installed by the LNER and became redundant after the last steam loco left the shed in 1966. Nevertheless, it was still standing in November 2017, one of only two remaining in the country, the other being at Carnforth. Immingham Dock conventional steam train station. The Immingham Dock tramcar station was over the other side of the dock entrance, to the left on this photo. Eastern Jetty; until 1939 used by all-First Class trains to meet luxury liners on cruises to places such as the Norwegian Fjords. Grimsby & Immingham Electric Railway tram cars at the Immingham Dock terminus.